At Sites & Paysages Le Val d'Authie in Villers-sur-Authie (Somme) camping costs as little as €18,- per night during low season with CampingCard ACSI. At one of the 50 touring pitches you will get a discounted rate during the period 01-04-2019 - 08-07-2019 and 26-08-2019 - 30-09-2019. At this campsite you can not only use your CampingCard ACSI for inexpensive camping, you can also use your ACSI Club ID (as an alternative ID). 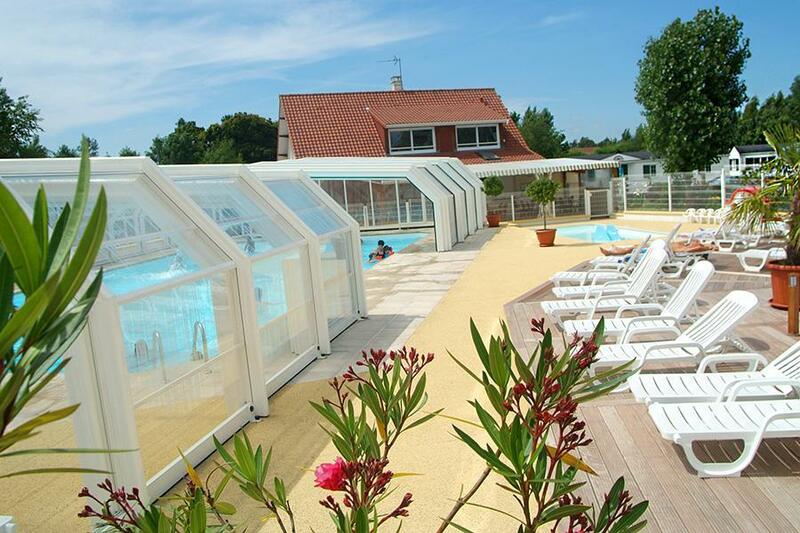 This five-star campsite with excellent toilets and many facilities is 10 minutes from the coast, with Marquenterre nature reserve, and from the woods at Crécy. The site is an oasis of peace and has a good restaurant, indoor swimming pool and wellness room. Good cycling options. One of the best sites I have visited. Excellent welcome despite late (21:00) non-booked arrival. We have a large car/caravan outfit. Guided to lovely, large (fully serviced) pitch (083) and advised of connections. Site very pretty and well maintained. Very clean facilities + lots of hot water! Didn't use pool but looked very good; tennis court excellent. Kids seeming to love the play park. Staff went out of their way to provide very good pizzas even after closing. Pretty area, easy cycling/walking; major stores at Rue nearby. Large site with mostly holiday homes taking up most of the site. Touring pitches fitted between or on the site edges. Very busy and quite noisy site although ok as a stop over to/from the channel ports. There are a lot of facilities on this site however we only stayed overnight and don't really need the entertainments on offer. Sadly our toilet block, while relatively clean, lacked the basic of hot water. The shower I had was tepid and my partner couldn't get that amount of heat. The pitch we were on was not the best we've had and there was little in the immediate surroundings/village. Great stop after getting off train at Calais. Just wanted an overnight but stayed for two as site lovely, staff friendly and good local walk in village for dog. Great for a short peaceful break. This is our 8th visit to this excellent site. We now have fortnight holidays here every year. This year was our golden wedding and they really looked after us including our meal in their excellent restaurant. Will be returning again next year if not before. This is the 2nd time we've stayed here. We love the site and the surroundings, the small bar and disco. The area in general is lovely and friendly. Would you like to book Sites & Paysages Le Val d'Authie or request more information? You can do both using the information below or by visiting the campsite's website. D901 Boulogne-Abbeville, exit Nampont, direction Villers-sur-Authie. CampingCard ACSI will send your information request to "Sites & Paysages Le Val d'Authie".